Happy Father’s Day! You’re the Greatest. Dad’s all over this country will receive cards, gifts, and time with their families because they’re… well, fathers! I’m not the biggest fan of relationship holidays like Valentine’s Day, Father’s Day, or even Mother’s Day. It’s not the sentiment that rubs me wrong, but the forced sentiment obliged by commercialization. That said, when these holidays slap us upside the head, we can ponder the gifts of these celebrated relationships. I’ll celebrate this day with family, but I also offer a game. 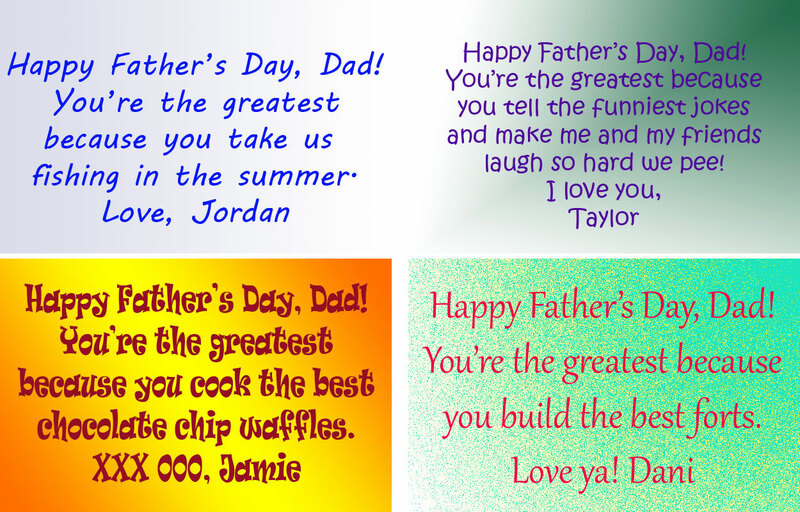 Meet four dads and read their “Happy Father’s Day” cards. Can you match each card to the dad? Marcus is a firefighter in a small town in Pennsylvania. He was raised mostly by his six siblings after his father was killed in a plant accident when Marcus was eight. He has a daughter by his high school girlfriend and two sons by his ex-wife. He spends as much time with his children as their moms, his work, and time allow. At least once a month, he sends a letter to each of them, hand-written and stamped. His daughter teases him about it and says he’s old-fashioned, but she collects her dad’s letters in a binder. Chuck (Charles Whitney Campbell, IV) is a CEO at a Fortune 500 Company. His relationship with his tycoon father was strained and cold. In college, Chuck met Ann, a brilliant girl with a full FAFSA and scholarship ride. In the beginning he dated this girl from a modest middle class family to irritate his father, but, shortly after spending the best Thanksgiving ever with her family, Chuck accidentally fell in love with her. While Chuck makes sure their three children have everything they need, he also makes sure he provides what Ann’s father gave to his children: playful devotion. Micah is a first-generation immigrant with a small sandwich shop that he opened in Houston a year after Katrina destroyed his home and the restaurant his father established in New Orleans. After a year in shelters and temporary housing, Micah decided to stay in Houston. He and his wife opened a deli-style sandwich shop instead of a full-service restaurant so that they would have more time with their four children. They still live in a small apartment where the children have to share a bedroom, but the little apartment complex with a pool and playground is their dream home. Louis is a doctor with a private practice in Boston. Louis was born and raised in Idaho, but moved to Massachusetts for college. He met Paul in med school and decided to stay. He and Paul have a son and daughter, both adopted. Despite the demands of their medical careers, Louis or Paul (sometimes both!) are always home after school to help with homework and cook dinner. Dinnertime is when they “put it on the table!” Not just the food. They share stories about their day. This is everyone’s favorite family time. Dear dads: It’s not your title at work, the games you buy, the things you accumulate, the money you spend. It’s the loving time you spend with them, the things you make with them, the games you play with them, the role you play in their lives. Those are the moments your children will hold in their hearts. If you’re still trying to match the cards, stop! You can’t. These four kids all received what mattered most. Those moments. Happy Father’s Day to all the dads. May today be a day of celebration and remembrance, a day to make new memories.